This product requires a compatible outdoor condenser for functionality. For over 50 years, Mitsubishi has remained at the forefront of the mini split industry thanks to their dedication to providing efficient, user-friendly comfort solutions. The MFZ-KJ09NA-U1 is a floor standing heat pump mini split indoor unit for use in single-zone or multi-zone systems. The sturdy design quietly operates providing comfort without disrupting your space. Mitsubishi's floor standing indoor units are a great alternative for rooms where you don't have the ceiling height or wall space to allow for a wall mounted unit. 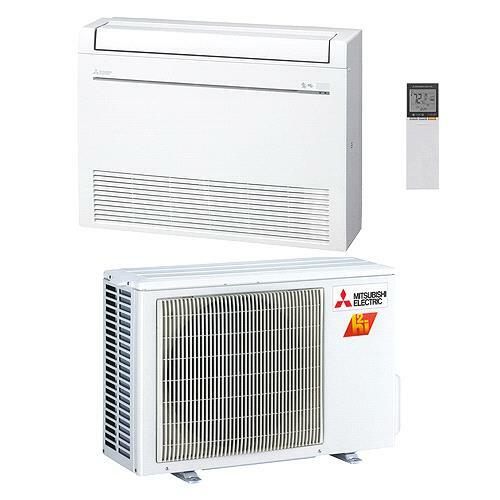 Mitsubishi's Smart Set function allows you to save a cooling profile and a heating profile, each consisting of a temperature, a fan speed, and an airflow direction. These profiles can be activated easily with a press of the Smart Set button on the remote. By slowly adjusting the cooling set point and swinging the horizontal vanes, the MFZ-KJ can improve the efficiency of cooling operations without compromising the comfort provided. When the indoor unit is run in dry mode and removes unwanted moisture. This improves your comfort and reduces the chance of mold growth and other property damage in the room. The powerful setting on the MFZ-KJ makes it easy to get your zone to the perfect temperature quickly. When it is activated, the unit temporarily increases refrigerant flow and fan speed to provide quick comfort through rapid heating or cooling. Auto mode selects the best vane position based on operating mode, and the swing modes cycle through all positions for maximum coverage. When 2 FLOW is selected the unit will blow air from the top and front of the unit. When 1 FLOW is selected, air only blows from the top of the unit.